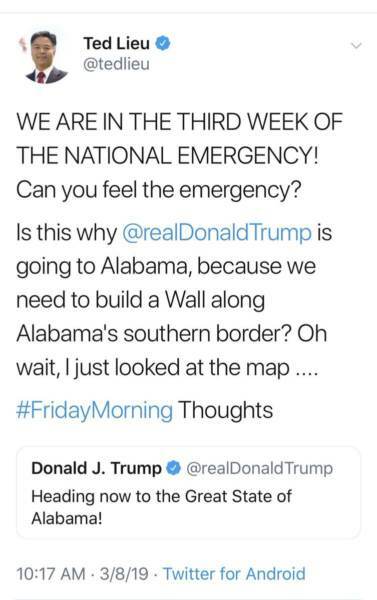 Trump antagonist Rep. Ted Lieu (D-CA) deleted a tweet posted Friday morning attacking President Donald Trump for taking a trip to Alabama. Lieu went off on Trump with Lieu acting completely unaware that parts of Alabama had been recently devastated by deadly tornadoes. Lieu later explained the tweet, saying he assumed Trump was going to Alabama for a rally. 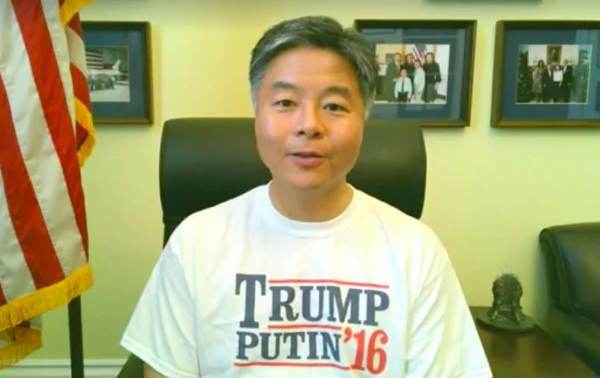 Rep. Ted Lieu (D-CA) in a previous display of Trump Derangement Syndrome. You have the absolute right to criticize my inappropriate tweet and to not accept my apology. It was your first Tweet that alerted me to the purpose of the President's visit. Thank you for your input. A simple reply to Lieu drives home the purpose of Trump’s trip to Alabama. The post Ted Lieu Deletes Insane Tweet Ripping President Trump for Trip to Alabama to Visit Tornado Victims appeared first on The Gateway Pundit.